Digital signage that stands out is more than just a naked screen on the wall. Screens are everywhere. We wake up with them; we go to bed with them. They’re on refrigerators, gas pumps, toilet stall walls, taxi seat backs, and of course they’re an ever-growing presence on our walls. We wear them, we stare at them and most people under 35 seem to have them glued to the palm of their hands. The rest of us aren’t far behind. Digital signage screens are everywhere at retail; helping us make decisions, providing service, checking us out; helping us place orders. We now look to these digital interactions to ease our shopping experience as we’re finding fewer and fewer sales associates to help us. Bank and credit union retail networks are no different and have deployed digital signage and other digital screen-based interactive platforms with a vengeance. Branch operators and marketers are reaping the many benefits of a digital merchandising and messaging strategy at retail. They recognize how these interactions sell more products and services, educate on financial well-being, demonstrate technology and otherwise provide a seamless and channel agnostic journey towards deepening the consumer relationship. However, with the proliferation of screens everywhere, including the branch, there’s a real danger of them becoming ignorable… in other words, they blend into the background like wallpaper. Screens use to be a novelty and we all starred at them in wonder as we were delivered news, community events, promotions on how to get that new app, and the like. Now, screens are ubiquitous and are all fighting for our attention amongst a sea of displays that are starting to feel like one big message stream, blending in with the rest of the screens in our lives. Compounding this “wallpaper effect” is the fact that most all digital signage installations are simply naked screens on a wall. They’re essentially a television. And we all know that most of the content we see on a television these days is a waste of time and that’s why premium on-demand networks like Netflix, Hulu and HBO are the way we watch now. Televisions, by themselves, are very ignorable. So if we’re going to leverage our existing digital signage systems (or craft effective new ones) it’s time to rise up, put on our design hats and create fresh “accessories” for our naked screens. Screens will still do the heavy lifting when comes to message details, but we first have to create a welcoming and inviting environment around them to provide context for them being something other than a “television”. And that’s what we do every day at Kiosk & Display. A multi-dimensional, multi-layered messaging system that surrounds and integrates a screen into its design is how you elevate and leverage your digital signage investment. An engaging experience is what you’re aiming for as you seek to unfold your unique and differentiated brand storytelling. By providing additional context and content to compliment your screen messages, you’re setting the stage for them to work harder and to reach your marketing objectives easier. For example, check out our recent work for Minster Bank. This Minster, Ohio community bank recently wanted an previously unused, highly visible wall to be turned into an engagement opportunity to take advantage of solid foot traffic in the branch. The opportunity was to reinforce the bank’s role as the local hometown provider that uniquely understands the people in the community. 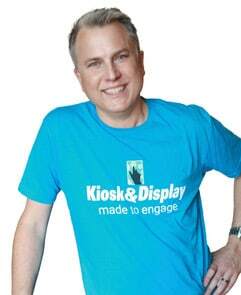 At Kiosk & Display our digital signage solutions are made to engage. In order to provide Minster Bank with their own custom-branded display we kicked off the project with a discovery session that not only established objectives, but also identified critical design criteria. This due diligence phase even included physical discovery as various screen sizes were cut from cardboard and placed live into the environment for first hand visualization and decision making. The discovery phase led to the design phase where renderings specific to this assignment were generated showing all components and how they work together for the desired messaging. Renderings are essential to fully understanding the total visual impact. Finally, the critical installation phase was led and supervised by Kiosk & Display to ensure all specifications were adhered to and completed satisfactorily. Note the similarity between the renderings and the installation photos. A second environmental merchandising opportunity for Minster Bank was the need to refresh an interactive self-service kiosk area and we followed the same process. Customers now fully understand what can transpire at the kiosk, including print on demand. On screen messaging supplies the balance of the information detail through an engaging animation loop. Likewise, our First Federal Bank of Midwest client wanted their naked screens to stand out from behind the teller line and at a refreshment station. This Defiance, Ohio community bank understood the “wallpaper” effect and was looking for custom branded backer boards to help make their screens pop. Now the messaging gets noticed when surrounded by elements that say, “hey, this isn’t just a television… watch this”. As a full-service digital signage company, Kiosk & Display helps clients with planning, designing, fabricating and installing high-quality digital signage and interactive kiosks. We stand apart from our competition with the award-winning iPoster messaging platform, our approach to custom branded content loops and our obsessive tech support. We also do our part to eliminate naked screens everywhere we go. Is it time we talk about cloaking yours with attention-getting storytelling content? Contact Jon VanderMeer- 800-724-8947 or sales@nullkioskanddisplay.com.